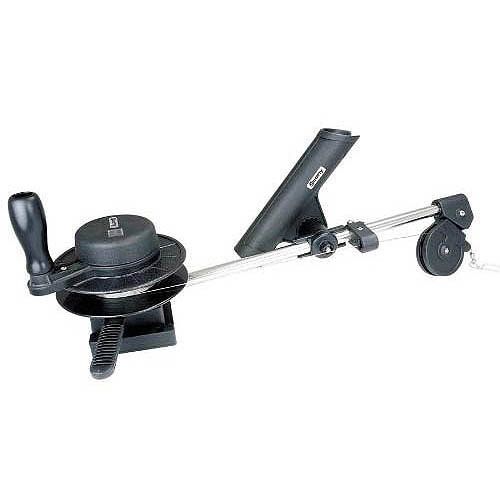 > Scotty %231050MP Depthmaster Masterpack includes an adjustable, boom-mounted Rod Master II Rod Holder and is rigged with a Quick-slide %231010 deck mounting bracket and a portable %231021 Clamp Mount. Features include a 23 inch, %26%23xBE%3B inch in diameter, stainless steel boom, a spray protected, positive drive depth counter, a Power Grip Plus Line Release, and Quick-slide %231010 Deck Mounting Bracket. It features an automatic brake with the most disc brake surface on the market. In the event of a bottom hang-up, it will pay-out to avoid losing gear. It has a high speed, one foot per turn spool coupled with the extra leverage extension handles makes cranking a breeze. Includes 200 feet of premium 150 pound stainless steel downrigger cable. The Depthmaster Masterpack offers more value for the fisherman than anything else on the market. The price and operating features of this unit beats the competition hands down.